Sellers who pair a discounted offer with a favour request can increase the probability that a consumer will purchase the offer. The consumer will then be more likely to accept the offer and buy. This principle does one simple thing – it creates the feeling that the negotiation is a reciprocal interaction, instead of just another sales tactic, by triggering a sense of cognitive ease. This finding has been uncovered in a study by Blanchard, Clarson and Hyodo. When I read it, I was intrigued by the different experiments that they run - not only to prove the effectiveness of this principle, but also to discover details about its correct use, i.e. : the do's and don'ts. What type of favour should I ask? How much of a discount should I offer? Will it work if I ask the favour first, and then offer the discount? Does it have to be a personal offer or will seasonal sales work? What increase in sales can I expect? And finally, how can I use this principle online? As I work in the optimisation of banks’ websites; this last question was particularly interesting to me - as we have many regulations to follow. Oh, and wait – while we are talking about favours, please could you do this one thing for me? Before you read on, look again at the principle and questions above and ask your colleagues or twitter followers what answers they expect. And see if their responses approach the ones I’ll provide below, which are grounded in research data. I’m sure you’ll be surprised. The white-dotted bar is the discount without the favour request (control), the grey bar is the recommendation or ‘refer a friend’, and the black bar is the online review; the first three bars represent the sale of a $100 coffee table , the second set are for the sale of a $100 record player. As you can see, both favour requests worked, albeit differently, based on the item that was on sale. The impact will change based on the favour asked. This makes me wonder: what impact do short online surveys have on website sales rates (Qualaroo and similar tools, for example)? And what impact could surveys have, if we prompted them at the same time or right after a user is presented with a special discount? This is something worth testing today. Not only will it help you gather some user data, it could potentially increase your sales rates (if you want to chat about setting this test or would like to share your results, please share in the comment section below, I’m super-curious!). Any small request will boost sales of a product, but some requests may be more effective than others depending on the product. So it’s worthwhile testing which requests work best for your product. The aim is to make the consumer feel that the deal is a reciprocal interaction, not another sale tactic. 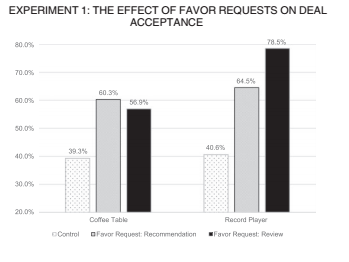 Interestingly, the positive effects of small requests seems to be more amplified at lower discounts. 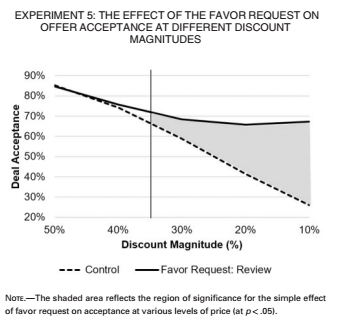 As you can see, the impact of the favour request is higher when the discount offered is lower. A 10% discount normally yielded a 25% sales rate. But when adding the favour request, the sales rate nearly tripled to 67%... wow! Have a look at the 30% discount: from about a 55% sales rate, without the favour, to 68% after a favour request was included. Interestingly; the effect went into negative when the discount offered was above 50%. At such huge discounts, the attractive rate overrules any positive effects that small requests could add to an offer. If you want to effectively use favour requests to boost sales of discounted products, combine it with discounts at or below 30%. When the favour is asked before offering the discount this likely wouldn’t be effective. People will rationalize the effect by feeling the discount is earned in exchange for the favor. We’d need to use a whole different principle altogether to achieve the desired results. A form of the Framing Effect Bias, known as the ‘Door in the Face’ technique, will convince a consumer to comply with a request – by asking a large favour first. As people refuse the first request – which they most likely will – they’ll feel more inclined to comply with the second, more acceptable request. 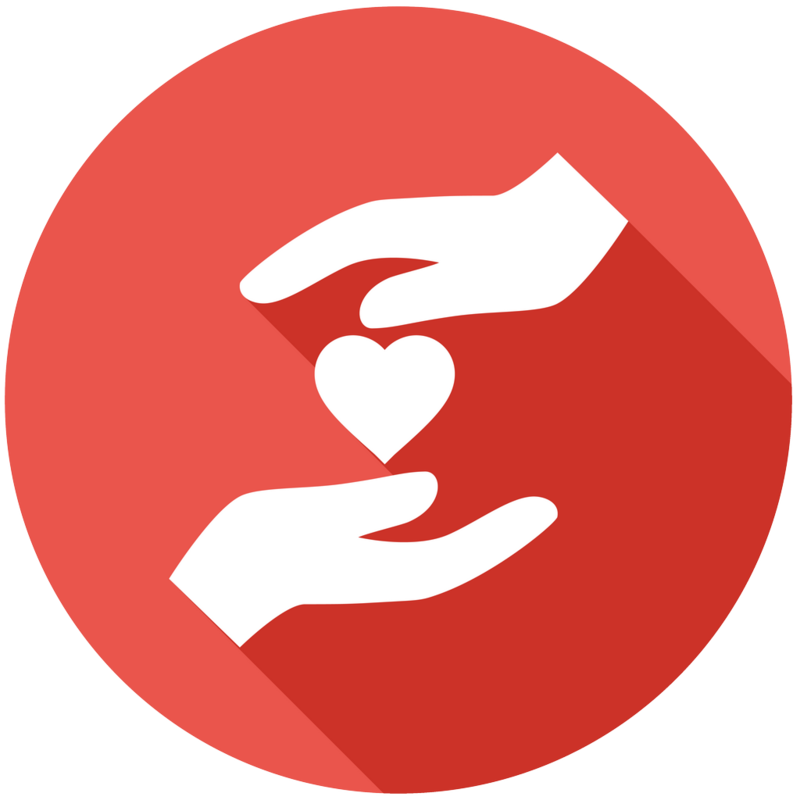 You could potentially ask a large favour first (Donate $50 to a charity of our choice), then offer a discount if they buy today (Here’s a 20% discount and if you buy today we’ll devolve a portion to the before-mentioned charity). I use the word “today”, as a bit of the Urgency Heuristic doesn’t hurt. Does it work with store-wide sales? While the Favour Request Effect is still triggered, the effect is greatly reduced. A personal discount showed a 47.5% sales rate (control) vs 83.6% sales rate when a favour was asked. The store discount group saw a 58.3% sales rate for control vs a 64.4% sales rate for the favour group. The reason: a store-wide discount is NOT seen as a personal sacrifice from the seller. No reciprocal interaction means no trigger for our principle. 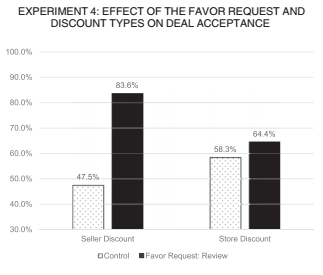 The favour request effect does work for store discounts, but not as much as personalized discounts. 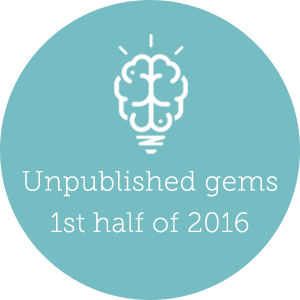 As you’ve read so far, the impact can be enormous. However the type of product sold, the discount offered and the favour asked will yield different results, based on how they are combined. Stick to the following rules to run your a/b test: a personal discount - below 30%, followed by a small favour (online review is probably the easier). After 2 business cycles (at least! ), evaluate your results and see what you can improve or change to increase your potential uplift. Test and find out, and be sure to share the results with your fellow marketers below. And finally, how can you use all this? I think I’ve set the foundations for this already in this article, but it’s important to raise one more point, before you set up your tests. Something to sell that interests your user. You’ll need to set up an A/B/C/D test, to gather the correct set of data. D: the user goes to the test page, a discount is offered and a favour is asked. Wording is imperative, as you risk triggering the feeling that the discount offered to the user is only available to users that comply with your favour, so be careful. For half of the clients, instead of waiting for an instant answer, ask sales agents to add something along the lines of “But before we look into pricing in detail, is there any chance that you could write a line about us to your connections on Twitter or LinkedIn? I would really appreciate it.” (Emphasising “I”). Then just look at the % of completed sales vs your regular average. 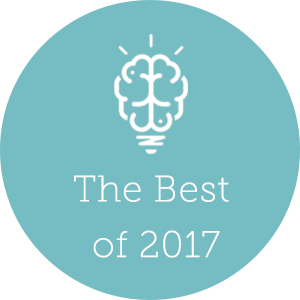 Please spread the love for NewNeuromarketing, for both our articles and writers. And feel free to get in touch, if you have any questions or interesting ideas. Written by Marcello Pasqualucci on Thursday, 29 September 2016.